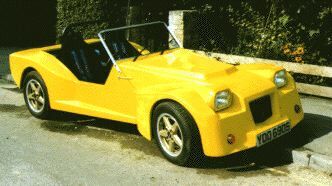 The Star was the first kit car designed by Jeremy Phillips the founder of Sylva Autokits and was put into production in 1984. The cars were based on a Vauxhall Viva donor using the front subframe and the rear axle. The looks of the car were not to everyones taste, but they did make an alternative to the pisspoor Dutton kits available at the time. The Leader was the next generation to emerge, based on the Star but with a two piece glass fibre body the Leader was used on both road and track. Brain Healey won the 750 Motor Club kit car championship for three years in a Leader 400 using a Ford 1700 Crossflow engine. The Striker is the bread and butter car for Sylva Autokits. With lighter construction than the Leader and a more seven-esque type body it is a great car for competitions and has been fitted with a variety of engines Crossflows, Fiats, Rotaries and V8s. The Striker has evolved during the years of its manufactor, originally available with "Clamshell" or, as shown here cycle front mudgards. The single prototype Mk1 Striker, known as the "Rotory rocket", was powered by a mazda twin rotor engine and worked hard around the race circuits for many years. The Mk 2 striker, by far the most popular Striker features rocker arm front suspension with inboard damper and springs. The evolution Mk3 used more familier whishbone and control rod front suspension. 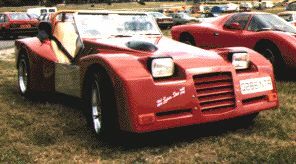 The Mk4 was a racing devlopment of the Striker that had a choice of fronts (droop snoot shown here) and no windscreen. This car was later built under licence and known as the Pheonix. 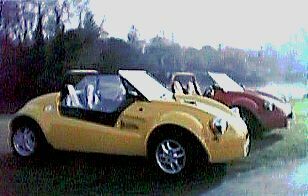 Further development has been carried out by Mark Fisher of Fisher Sportscars and is now called the Fisher Spyder. The Jester represents an inovative change of style, that reflects a move back to the roots of the kit car movement. Using a Ford Fiesta interior and cost effective components this fun to drive car can be put on the road for a modest outlay. 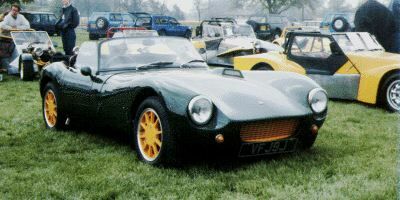 1999 saw the reintroduction, by Sylva, of the popular Mk4 clubmans. This excelant racer is bound to do well on both the track and road. Shown here fitted with a Fiat twin cam but Ford Zetec is an option. The latest innovation from the Sylva factory is the Sylva Mojo. A mid engined flyer bases on components from a Mk2 Fiesta and a multi-tube chaises covered in elegant Gel coated fiberglass. Suspension at the front is an updated version of the top rocker arm and at the rear is a De Dion located, twin trailing arm with panhard rod arrangement. More details from the Sylva factory in Louth. Mojo interior and rear engine bay.